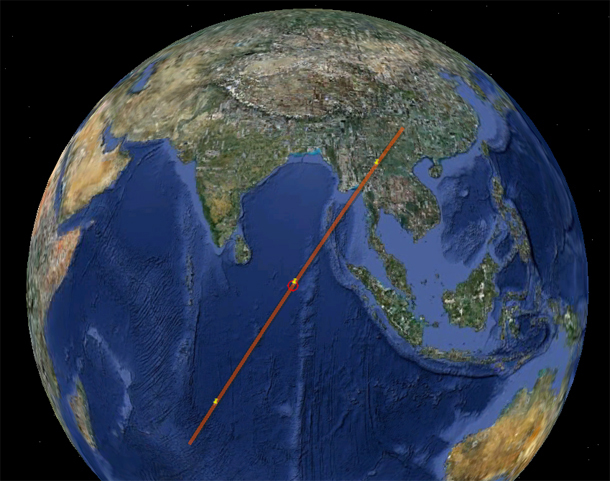 We’re less than a day away from ROSAT’s final plunge into Earth’s atmosphere. Even this close to its last moments, it’s difficult to know just where it will drop down; it’s orbiting the Earth at 8 km/sec (5 miles/sec), so if predictions are off by just a couple of minutes that translates to a nearly 1000 km (600 miles) in position! And the models are still uncertain by a few hours. to give you an idea of what it will look like. As it stands, right now as I write this the nominal time of re-entry is sometime on October 23 between 06:00 and 13:00 UT (02:00 – 09:00 Eastern US time). The uncertainty means we still are not sure just where on Earth it will come down. ROSAT is an astronomical satellite, designed to observe high-energy X-rays from space. Launched in 1990, it has a mass of about 2.5 tons, much less than the UARS satellite which came down in September. It was shut down in 1999 after some of its hardware failed; during the decade it was operational it provided astronomers with vast amounts of data about supernovae, black holes, neutron stars, and other cool cosmic objects. It’s been in low-Earth orbit ever since. Over time, the very tiny drag it has experienced due to passing through the very thin upper atmosphere of our planet has dropped it into an ever-lower orbit, and now, after several years, it’s about to re-enter for real. Most of the satellite pieces are fragile and will burn up as they slam into the Earth’s atmosphere. About 30 more durable pieces are expected to survive re-entry and make it all the way down to the ground. The thing is, one of those pieces will be the mirrors, which are heavy. ROSAT’s mirror assembly was designed to withstand a lot of heat (otherwise thermal stress — flexing under temperature changes — would have messed up its ability to see astronomical objects), which means that it will be able to stay intact as ROSAT comes down. The total weight of the mirror assembly is about 1600 kg — well over 1.5 tons. That’s a big chunk of material. The good news here, as it is with every time space junk returns to Earth, is that our planet is big. 500 million square kilometers (almost 200 million square miles) is a lot of real estate, and the pieces coming down are small. Most of the Earth’s surface is water, and most of the land is unoccupied. That’s why the odds of anyone getting hit are so small; about 1 in 2000. And that’s for anyone getting hit! The odds of you specifically getting hit are more like trillions to one. Think of it this way. I have a deck a cards, and you pick one at random. What are the odds of you picking the ace of spades? 1 in 52. Now let me get 52 people and do the same thing until the cards are gone. What are the odds someone picked the ace of spades? 100%. But your odds of getting it are still small. So the odds of any particular person getting hit by ROSAT are incredibly small, and there’s not much to worry about. In fact, on Science Friday, Mark said that stuff from space burns up over the Earth pretty much every day! Yet you never hear about anyone getting creamed by a fuel tank or an errant wrench. So there you go. As the time gets closer I’ll post important updates as I hear them. For current news on the situation, I suggest following ROSAT_reentry on Twitter, who has constant updates on the predicted re-entry time, as well as plots and pictures of what’s going on.